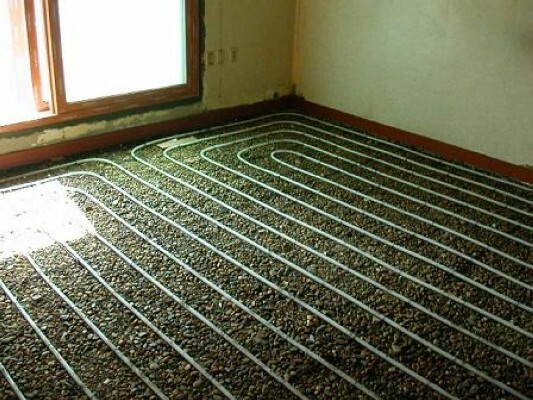 Korea has a very unique heating system called the Ondol. This is the heating system that has been used in Korea for thousands of years, and still is the most common system in Korean architecture. To understand the Korean culture better, you should know about the Ondol. What makes the Ondol very special is the means it uses to transfer heat. Unlike Western radiator system which heats up the vicinity air, Ondol transfers heat through the entire floor. It can be hard to understand without a visual explanation. Picture 1 is the traditional Ondol system. The Agungi(아궁이) is the traditional fire place located at the kitchen area, and that is where the Ondol gets its source of heat. In other words, the heat is used for both cooking and heating at the same time: energy saving. People set up a fire at the Agungi, and the heat passes through the channel underneath the floor until it reaches the chimney. As the heat passes the channel, the floor, which was usually made with mud and stones, gets warmed up. Thanks to the nature of mud and stones, heat is preserved for a very long time even without a big fire at the Agungi. This is a very energy efficient way of heating. The meaning of Ondol is warm stone in Korean, that explains everything. There are several advantage of Ondol over Western radiator heating. First, it holds up the heat for a very long time even after you put out the fire. Traditional Korean houses, Hanok(한옥), usually heat up the Ondol during dinner time, and the warmth lasts till the next morning. Second, it evenly distributes heat in the room. Though the floor near the Agungi tend to be warmer as it's closer to source of heat, the whole room gets warmed up very evenly. Think the whole floor as a big radiator, and the radiant heat spreads out from the bottom of the room to the top as warm air moves upward in simple science. Third, it is carefree of maintenance. Since it is the part of the main structure of a house, there is nothing really to fix or go wrong. However, there are disadvantages of Ondol as well. It needs considerable amount of time to heat up the room as mud and stones do not get heated up easily. Moreover, it's hard to control the temperature of the room. To match up better with modern lifestyle, the idea of Ondol has evolved in newer Korean houses. Since most Koreans these days live in apartments/condos in city, architect changed the structure of Ondol. It is now nothing to do with Agungi. The heat source is boilers. Yet the core idea of Ondol is still there. There is long curvy metal pipe that runs underneath the floor, which is filled with water (Picture 2). People can control the temperature of the room with a thermostat, which controls the temperature of the water inside the pipe. These days, you can find this system as underfloor/infloor heating in the US as well. Thanks to Ondol, Koreans do not wear shoes at home. Since the floor is the warmest part of the house, people would appreciate direct contact to the floor. This is also the biggest reason why Koreans did not use a bed at home. They rather slept on the floor with a very thick blanket for cushioning. Yet the influence of Western culture, most of today's Koreans sleep in beds. If you are puzzled why Koreans take off their shoes at home, this is one of the main reasons. Well, it's also part of a Korean culture that has passed down generations anyway.